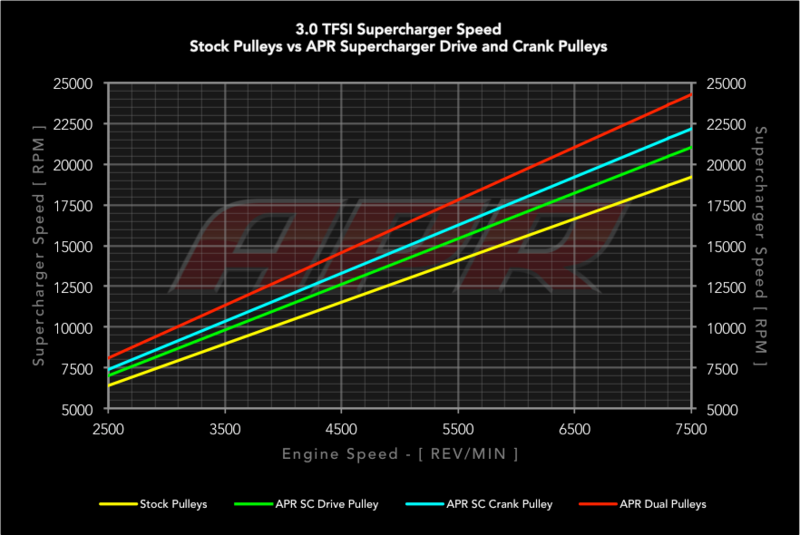 APR’s Supercharger Drive Pulley Upgrade decreases the diameter of the factory pulley from ~63.25mm to 57.75mm, which in turn spins the supercharger ~9.5% faster. 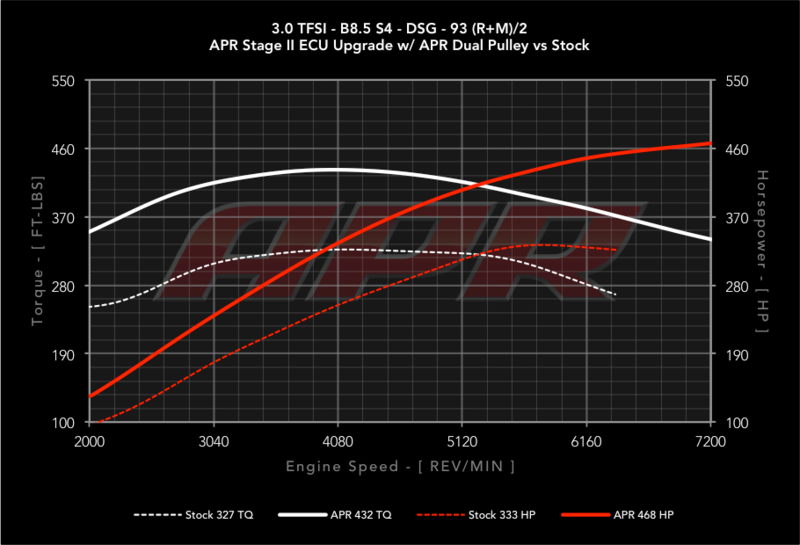 This results in a healthy bump in horsepower and torque across the entire RPM range with the supercharger operating at a higher rate of speed. The pulley is CNC machined from billet stainless steel, e-coated black for an OEM appearance and is press fitted or bolted to the factory supercharger unit. 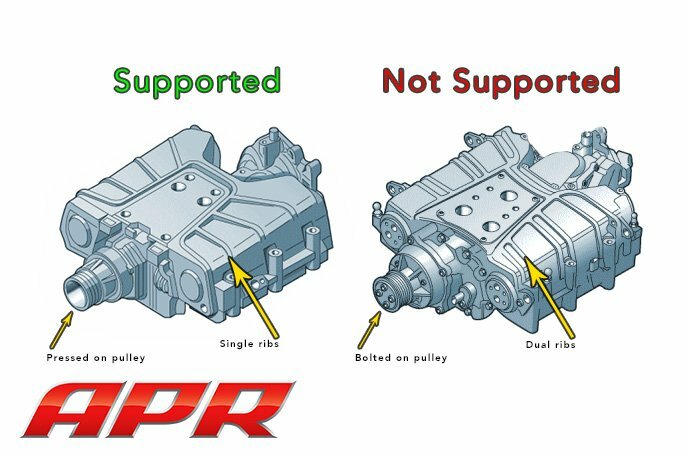 This upgrade is only applicable to superchargers with a pressed on pulley as shown here. - Pricing: Please contact us for pricing outside the USA. This product is designed for use with APR's S Tronic TCU Upgrade, NGK BKR9EIX plugs gapped @ .024” +/- .002” torqued to 30Nm and a new supercharger belt. 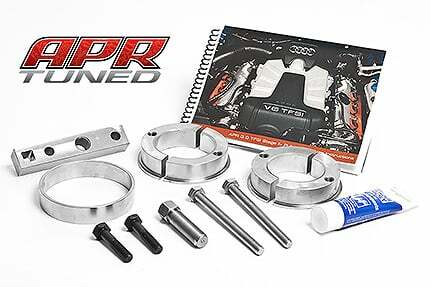 The APR Supercharger Cooling System is highly recommended and required with the dual pulley setup. IAT’s must be below 75c to achieve the advertised power figures. A high flow intake system is highly recommended and is required to meet the advertised power figures on the A4/A5/S4/S5/Q5/SQ5. For the best results, APR recommends removing the intake snow screen. The factory supercharger drive pulley is pressed on to the supercharger's input shaft. It's not possible to remove the factory pulley without damage, or damaging the supercharger itself unless special care and attention is taken.